The DX140LC-5 14-tonne and DX140LCR-5 15-tonne (right) ... on show at bauma. 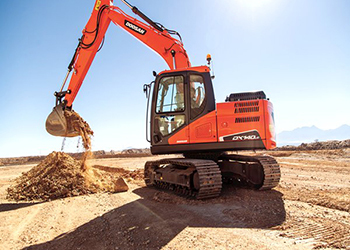 Products from Doosan’s various brands, right from excavators to generators, will go on show at a key construction show next month. 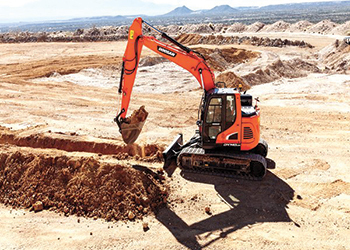 Doosan Construction Equipment will be presenting every aspect of the company’s business at bauma 2016, a premier construction equipment showcase to be held in Munich, Germany, next month. It will encompass many new Doosan Heavy, Bobcat and Doosan Portable Power product launches as well as the latest initiatives from the company’s attachment and aftermarket support operations. “The Doosan Heavy display will include the new five-tonne DX57W-5 wheeled excavator which, in addition to complying with the latest Stage IIIB emission regulations, incorporates many new features that increase performance, operator comfort, durability and fuel efficiency,” says a company spokesman. The DX57W-5 has increased power from the 42.5 kW (52.3 hp) Doosan D24 four-cylinder engine, which also offers convenience and lower costs by meeting Stage IIIB emission regulations without the need for a diesel particulate filter (DPF). Factory tests show a 15 per cent increase in fuel efficiency, depending on the mode of operation and the work being done. Also on display will be the new Stage IV-compliant DX140LC-5 14-tonne and DX140LCR-5 15-tonne crawler excavators, which set new benchmarks for this size of machine worldwide, providing greatly improved performance compared to the previous ‘-3’ Stage IIIB models, he adds. The DX140LCR-5 15-tonne ... on show at bauma. Both new excavators are powered by the Perkins 1204F engine, which combines reduced fuel consumption with the power and torque of larger engines with a smaller displacement. Doosan is also showing new mid-size Stage IV-compliant machines for the first time. These include the DX140W-5, DX165W-5 and DX190W-5 wheeled excavators; and DL200-5 and DL250-5 wheel loaders. In addition, there will be a comprehensive display of Bobcat new-generation compact loaders, compact excavators, telehandlers and attachments with warranty. “The company has launched a new standard three-year warranty for the complete range of Bobcat rigid telehandlers manufactured at the company’s plant at Pontchâteau in Loire Atlantique in France. It is available as standard in Europe, the Middle East and Africa on all the models in the Bobcat telehandler range from the T2250 5-m telehandler to the top-of-the-range T40180 18-m model,” says the spokesman. Furthermore at bauma, Doosan Portable Power is launching the G400-IIIA (400 kVA prime power) and G500-IIIA (500 kVA prime power) generators meeting the EU Stage IIIA engine emission regulations for generators. “As well as incorporating the changes required to meet the Stage IIIA regulations, the new generators have been redesigned to offer increased reliability, high performance and a wider choice of features to meet the needs of temporary power applications,” says the spokesman.